At Hamilton, Victoria, perennial grass hedges provided very effective shelter. The wind speed adjacent to the hedges was reduced by up to 99% compared to the unsheltered areas. This reduced the average number of days with poor lambing weather (chill index greater than 1000) during June-September by more than half, from 10-13 down to 3-4 days per month. At Bengworden in Gippsland, wind chill was reduced by 79% and 60% in 2010 and 2011 respectively from saltbush hedgerows compared to open areas. 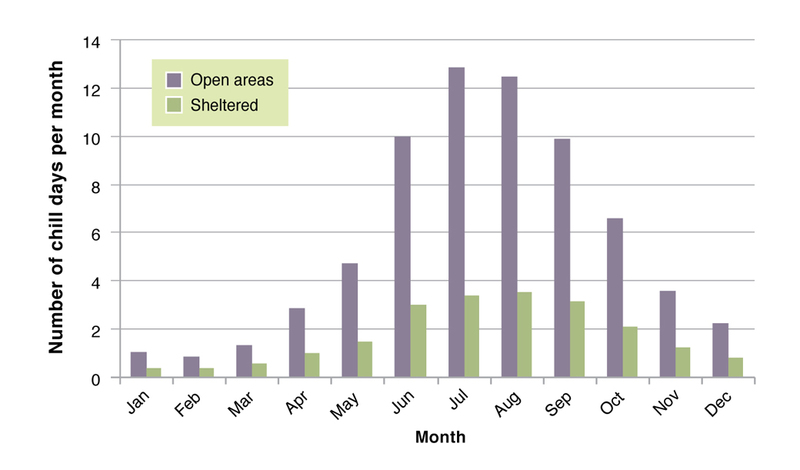 The benefits of shelter vary between locations and lambing times, are greatest for lambing in July and August. The regions with the greatest benefits are the Tablelands of New South Wales, south-western Victoria, and exposed parts of Tasmania. At Hamilton, twins and triplet lambs derived the highest benefit from shelter due to their lower birth weight and higher susceptibility to cold, wet and windy conditions. Twin lamb survival increased by 15% when lambs were given shelter; twin lamb survival at the average birth weight increased from 76% in the open areas to 87% in the sheltered areas. For lambs of average birth weight, regardless of whether they were born as singles, twins or triplets, survival at the Hamilton site increased by 30% when grass hedgerows were used for shelter. At Hamilton, Merino and Coopworth twin lambs derived similar proportional gains in survival from shelter. As a result of the improved survival rates, per 100 ewes lambing, 18 extra Coopworth lambs and 24 extra Merino lambs were marked. This resulted in the Coopworth ewes marking 157% (sheltered) compared to 139% (unsheltered) and Merino ewes marking 126% (sheltered) and 102 % (unsheltered). At Wagga Wagga, New South Wales, survival in 2008-09 was 10% higher (77%) for twin lambs born in shrub shelter compared to hessian rows (70%). 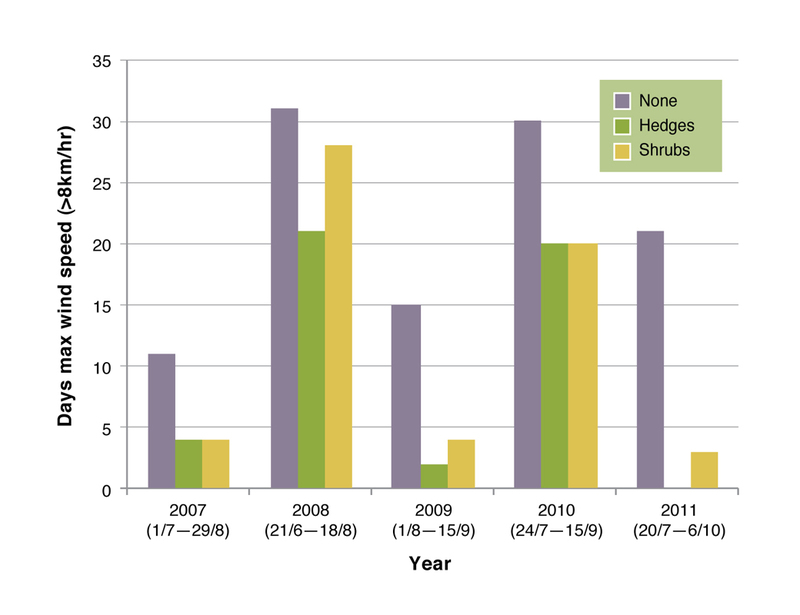 Phalaris hedgerows were ineffective in 2006-07 because ewes ate them and they did not regenerate after drought. However in 2010, survival of twin lambs was not significantly increased by shrubs (72%) compared with open paddocks (69%). At Wagga Wagga, survival of twins sheltered by hessian rows was reduced at high (30 ewes/ha, 63% survival) compared to low (16 ewes/ha, 83% survival) stocking rates in 2010. Based on the results of 2009, providing shelter to twin-bearing ewes at the Hamilton Proof Site was worth approximately $5/ewe mated. Taking into consideration the costs of establishing the hedgerow system the breakeven period was three years. Increasing lamb weaning percentage is a major priority for the sheep industry with current average weaning percentages sitting at 77% (Trompf 2012). Nationally, approximately 40-42 million ewes are mated producing 30-32 million lambs. 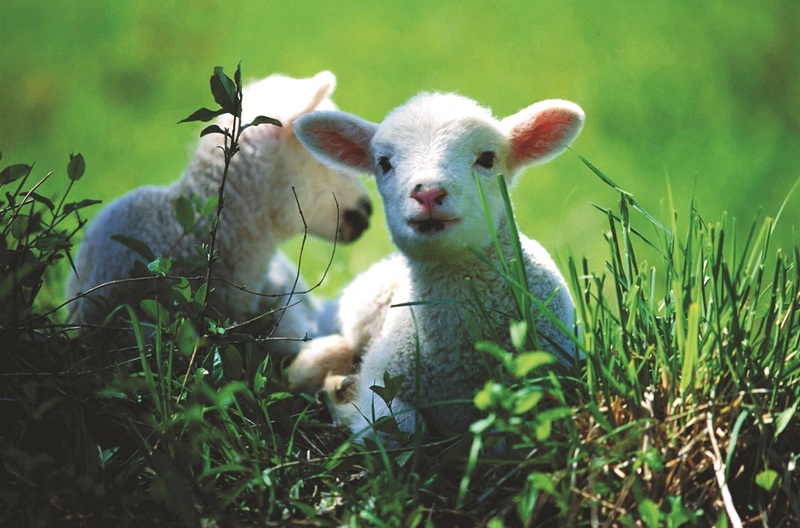 The number of lambs weaned is a function of conception rate and their subsequent survival. For farmers, more lambs weaned can lead to greater profits if the increase in lamb numbers can be achieved cost-effectively (Warn et al 2006). Where low weaning rates result from low lamb survival, this presents issues for both farm profit and animal welfare. In south-eastern Australia, the greatest number of flocks lamb between June and September. During these months, it can be cold, wet and windy resulting in a high proportion of days experiencing bad chill in high risk areas (Figure 1). Chill index is calculated from wind, rain and temperature. A bad chill day is one where the chill index exceeds 1000 kJ/m2/h and the risk of lamb mortality increases significantly (Figure 2). Twins and triplets are more susceptible to poor lambing weather than singles – their smaller size and relatively larger surface area means they expend more energy to maintain their body temperature. In high risk areas, survival of less than 40% of twins has been observed. Lamb survival is calculated as the number of lambs alive at a time point divided by the number of lambs born and expressed as a percentage. Survival to lamb marking can be calculated from the marking percentage and the percentage of lambs conceived (pregnancy scanning rate) e.g. For 140 lambs marked in a mob of 100 twin bearing ewes (200 foetuses scanned) the survival of twin lambs is 140/200 x 100 = 70%. The level of loss of lambs is a concern to farm profitability as well as animal welfare. Singles are resilient, so to improve marking percentages, the focus needs to be on improving the survival of twin-born lambs. Twin lamb survival can be improved with more focus on ewe nutrition throughout pregnancy and at lambing, but in environments that experience poor weather, shelter should also be a priority. 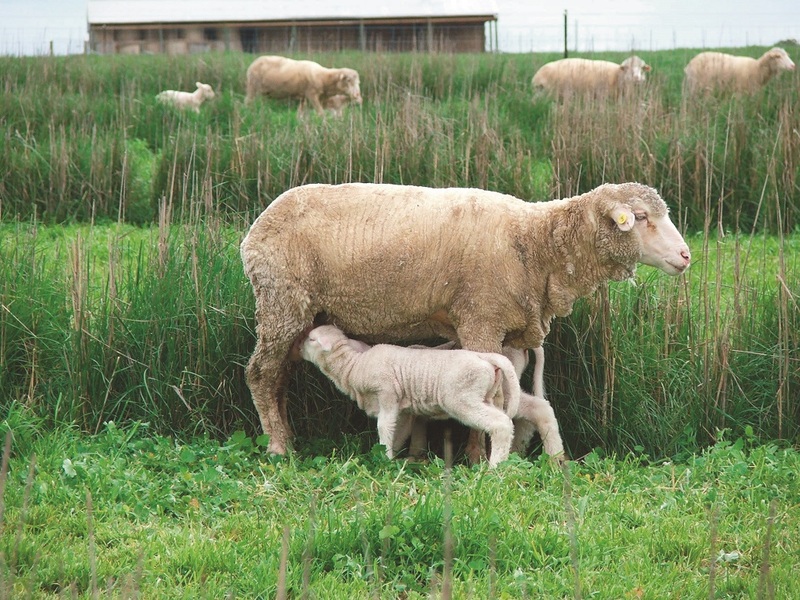 This page provides the outcomes from EverGraze experiments at Hamilton and Wagga Wagga, which used various forms of shelter for increasing the survival of lambs. Further information on lamb survival can be found in the EverGraze Exchange – Improving the Survival of Lambs. In addition to the need to achieve productivity benefits from improved lamb survival, the EverGraze team needed to design systems that would achieve benefits to natural resources, including increasing soil water use, thereby reducing salinity, water-logging and soil acidification. 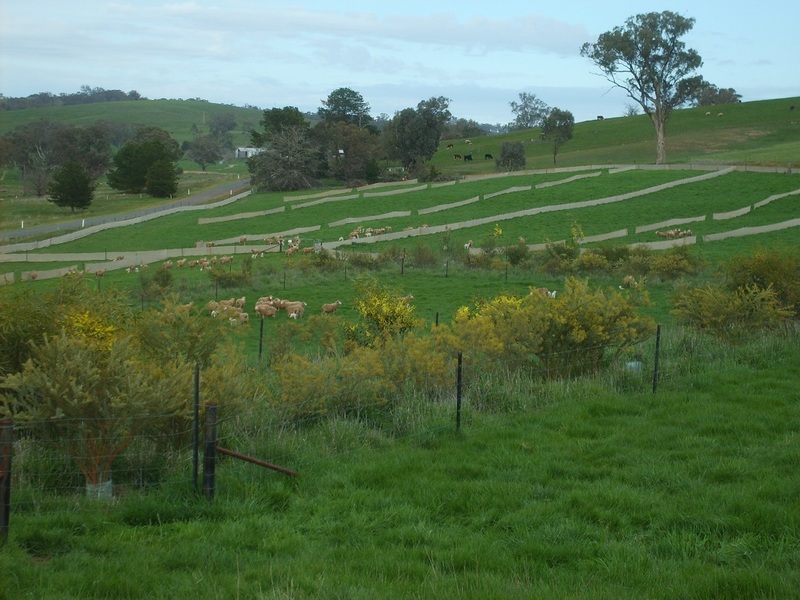 To achieve these dual benefits, perennial grass hedgerows were set up at Hamilton, while shrubs were used at Wagga Wagga. The shrubs had potential to provide additional biodiversity benefits as habitat for native wildlife. The hedgerow grass species at Hamilton was chosen because it was also summer active and therefore had the potential to use more water during summer/autumn. See the Wagga Wagga Water use by shrubs at the break of slope page for further information on recharge control using shrubs. Further information is also available in the EverGraze Exchange – Shrub belt hedges for shelter and recharge control. At the Hamilton EverGraze Proof Site, hedges of *tall wheatgrass (Thinopyrum ponticum cv Tyrell) were set up in a north-south direction, at right angles to the prevailing westerly winds. Perennial ryegrass with sub-clover pasture was also sown between the hedgerows to provide high quality feed thereby providing ‘maternity wards’ for lambing ewes. The close spacing between the hedges was important since ewes do not seek shelter at lambing. In theory, the highest benefit from every one metre of shelter will occur within 10m of the structure. Tall wheat grass was therefore selected as it grows to over one metre tall and is clump/tussock forming when allowed to become rank. The stems are also thick, fibrous and ‘springy’, and remain upright after the animals move through the hedges. When rank, the species is less palatable so animals preferentially graze the inter-row forage, leaving the hedges relatively intact. 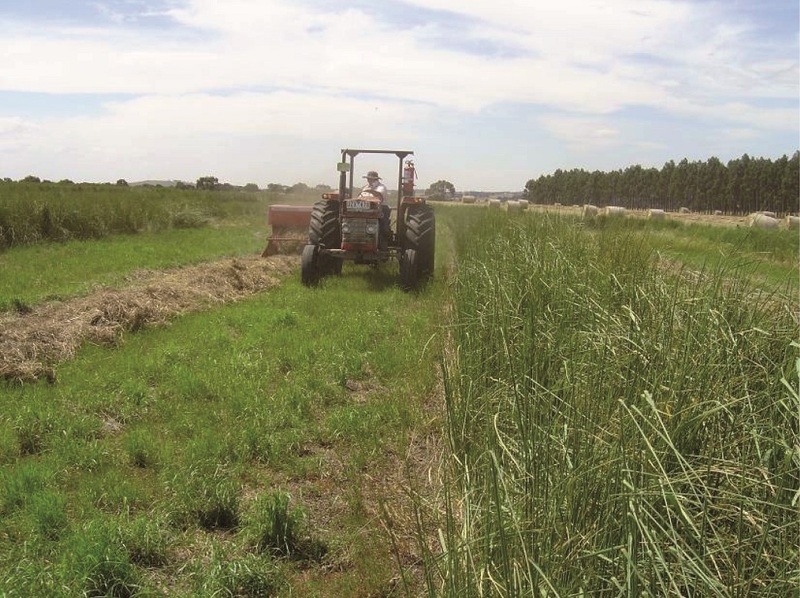 *While tall wheatgrass is highly suitable as a hedgerow grass species, a weed risk assessment undertaken by the Future Farm Industries CRC has identified tall wheatgrass as having a high environmental weed risk for Victoria through its capacity to invade and impact on wetlands. For this reason, the CRC does not recommend the planting of tall wheatgrass in Victoria. Agriculture Victoria considers that because tall wheatgrass is already widely distributed and has production and animal welfare benefits, its continued planting is appropriate provided that the following practices to reduce the risk to native vegetation are adopted: To minimise the risk of tall wheatgrass spreading into areas where it is unwanted, hedgerows should be grazed in January and February to remove immature seed. Areas surrounding tall wheatgrass should be sown to competitive species such as perennial ryegrass and phalaris to reduce the chance of spread outside the sown area. Hedge areas should be located well away from waterways or natural wetlands not only to reduce the chance of spread, but because these areas are often too wet for lambing and can harbour foxes. The grass hedges were sown and established in September 2004 in strips 1-1.5m wide, separated by 10m bays that were sown to other high quality forages and pastures (e.g. Italian Ryegrass/Balansa clover, wheat grass/sub clover and Banquet perennial ryegrass/sub clover). Hay was cut from the inter-row areas the spring following sowing, while the tall wheatgrass was allowed to grow rank and send up seed heads. 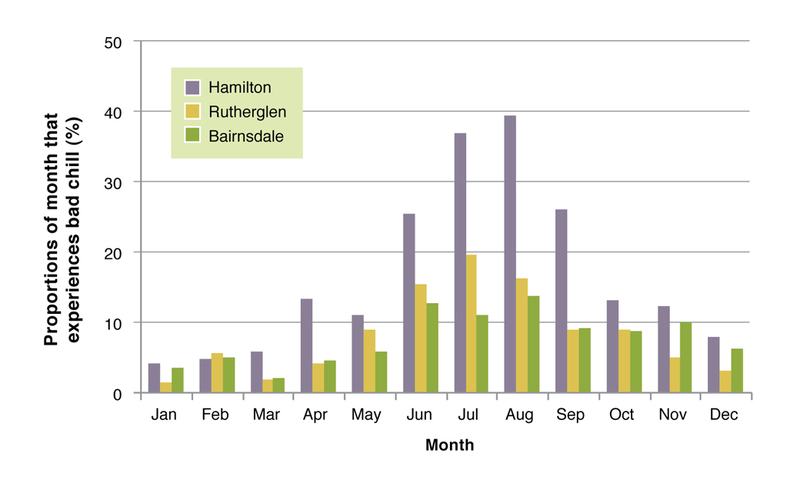 At Hamilton, during times when wind, temperature and rainfall conditions are likely to kill new born lambs, the winds come most frequently from the west, north west and south west during August and September. The hedges were therefore set up in a north-south direction at right angles to the wind direction to provide the greatest protection. Wind speed measurements were taken throughout the lambing period each year. These were measured at lamb height (40cm) at 10 minute intervals in the open areas and at a distance of 20cm from the hedge row in sheltered areas. In August 2009, ewes on the Hamilton EverGraze Proof Site lambed down in either the hedge row shelter areas or on the flat/slope open areas of the site in normal pasture paddocks. Ewes were stocked in small plots (~0.5ha) at between 24 – 30 ewes/ha depending on genotype in the hedges. Both the Merino and Coopworth/composite ewes were greater than condition score 3 at allocation for lambing. For further information on the setup of the hedgerows experiment, see the EverGraze Action – Perennial grass hedges provide shelter at lambing. A short video shows the ewes and lambs sheltering in the grass hedgerows at Hamilton. At the Wagga Wagga EverGraze Proof Site, three different forms of shelter were trialled to determine their impact on survival of new-born lambs. 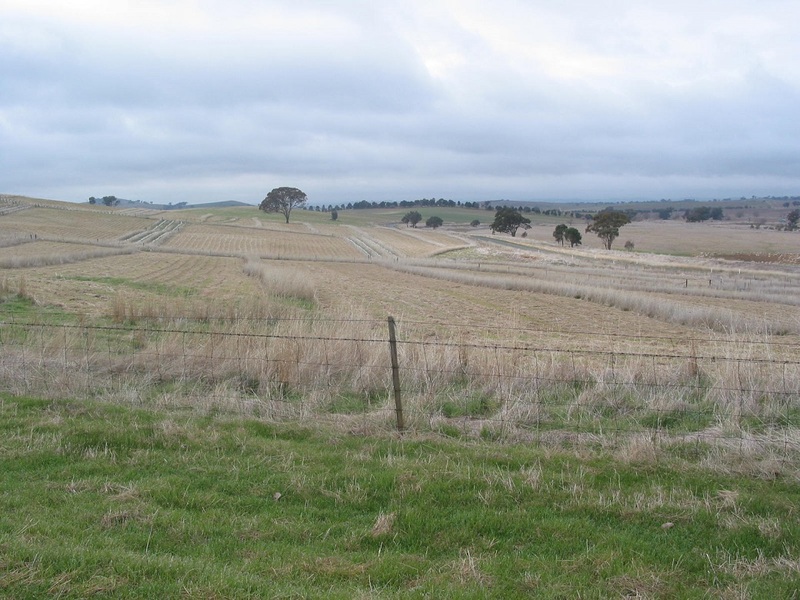 In 2006 and 2007 phalaris hedgerows were trialled, but these did not regenerate after drought so were replaced with rows of hessian in 2008 and 2009. Twins were compared in shrub or phalaris/hessian row shelter, and singles were compared in phalaris/hessian or open paddocks (unsheltered) (Table 1). Around 20 Merino ewes joined to Poll Dorset rams were placed in each plot in each year. Singles plots were one hectare and twin plots 1.3 ha to allow for the higher feed requirements of twin-bearing ewes. In 2010, the experiment was repeated using only twins in shrub compared with open paddocks. Also in 2010, stocking rates of 16 or 30 twin-bearing ewes/ha were compared in paddocks sheltered by hessian rows. A combination of shrub and hessian rows was used as shelter in the experiment. The acacia shrubs were planted in October 2005 every four metres in an E-shaped design located 50m apart. Each row was three shrubs deep (10m total). 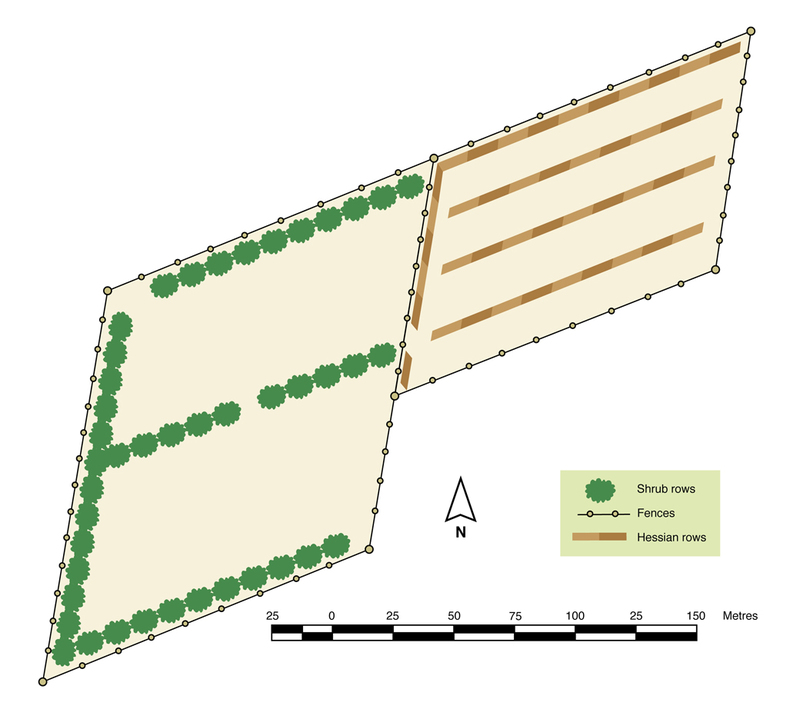 They were fenced to prevent grazing, with a single three metre wide access walkway through the central shrub belt (Figure 3). Hessian rows were 1m tall and 20m apart, strung on plain wires one metre high, held by fence posts. The internal hessian rows had gaps placed every 25 to 30m to allow sheep movement. Figure 3. Layout of shrub belt and hedgerow shelter. Lambs sheltering in hessian row shelter. At Wagga Wagga, wind speed was measured during lambing each year at 30cm height and for all but 2009, they were taken at ten times the height (10H) from the shelter, 25m from the shrubs and 10m from the hedges. In 2009 the measurements were taken at 2.5H, 5.0H and 10H. The wind direction was not differentiated in the measurements. The wind speed adjacent to the perennial grass hedges at Hamilton was reduced by up to 99% relative to the unsheltered areas, making it a very effective form of shelter (i.e. greater than 75% reduction in wind speed). 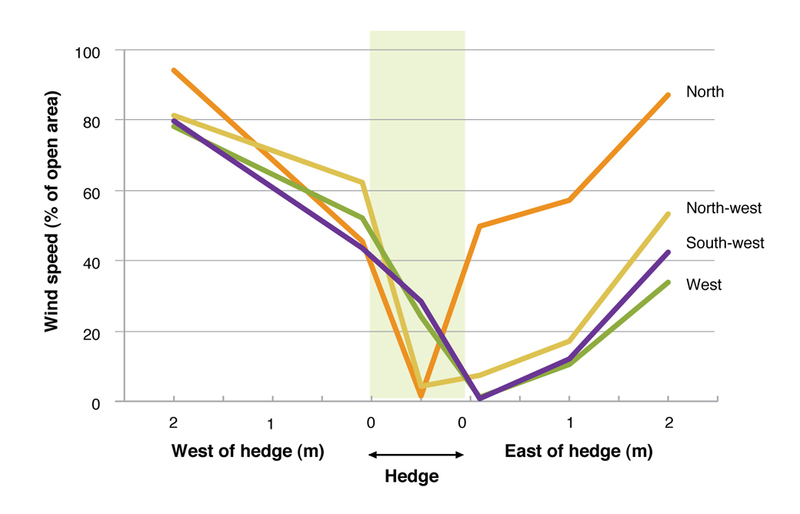 For westerly winds, the hedges were highly effective for reducing wind speed (Figure 4). The hedges were permeable and provided the opportunity to shelter within the hedgerow when the wind was from the north. These hedges would be expected to reduce the average number of chill days per month (chill index >1000kJ/m2/h) from nearly 10-13 days down to three or four days (Figure 5). Figure 5. Number of chill days per month (heat loss exceeding 1000 kJ/m2/hour), calculated from long term daily records for the Agriculture Victoria Hamilton weather station in hedgerow sheltered areas versus open areas. The number of high chill days at Wagga Wagga was too low to demonstrate the effect of the shelter on chill. 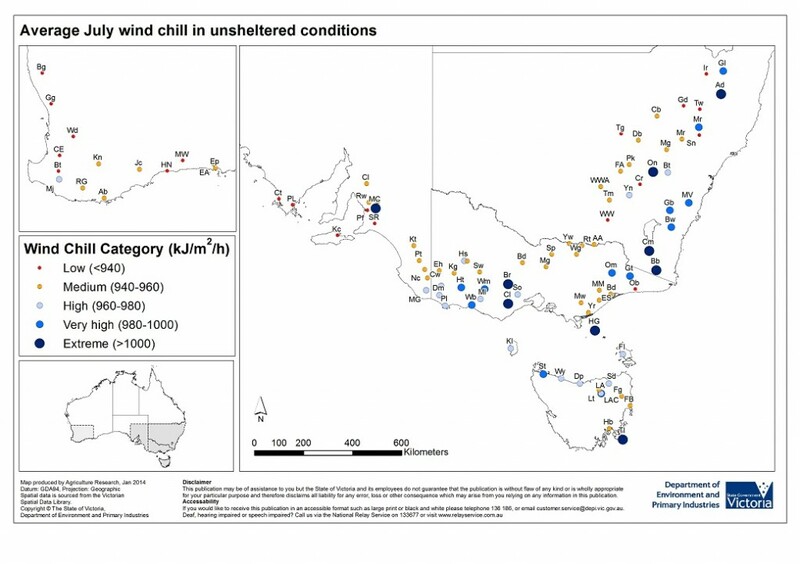 However, both the hessian hedges and shrubs at Wagga Wagga showed reduced wind speed compared to open areas, demonstrating their potential for areas with a higher risk of chill (Figure 6). Figure 6. Number of days during lambing each year when wind speed exceeded 8km/hr. The wind speed measurements shown in Figure 6 were taken at a height of 30cm and for all but 2009, they were taken at 10 times the height from the shelter – 25m from the shrubs and 10m from the hedges. Direction was not differentiated. In 2009, the values shown are an average of the measurements taken from 6.25m, 12.5m and 25m from the shrubs, and 2.5m, 5m and 10m from the hedges. The average wind speed (from all directions) in 2009 was 65% at 2.5m, 73% at 5m and 86% at 25m from the shrubs compared to open areas. At the average birth weight of 6kg, lamb survival increased by 30% when hedgerows were used for shelter at Hamilton. Survival rate was 69% in the unsheltered areas and 90% in the paddocks with shelter (Figure 6). This average was achieved across all birth types (singles, twins and triplets) and across Merino and Coopworth terminal lambs. The results indicate that if nutritional and condition-score targets for pregnant and lambing ewes are met, optimising birth weight of lambs and maternal bonding, producers can still benefit significantly by providing effective shelter in environments that have a high risk of wind chill. Figure 7. 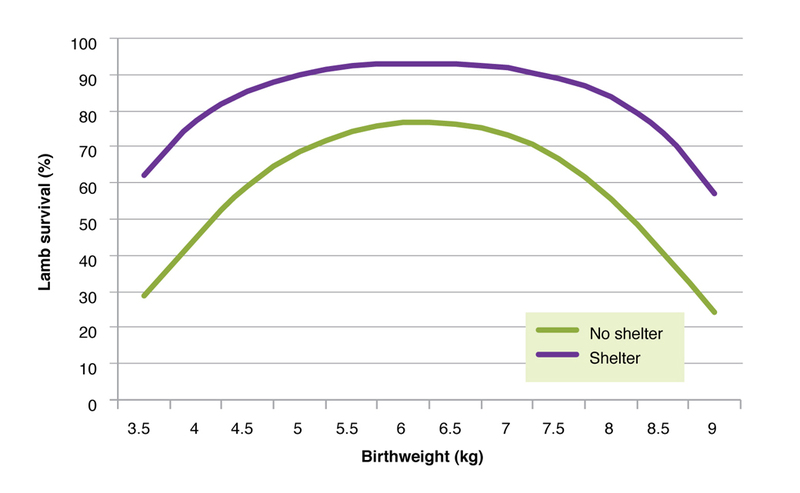 The relationship between birth weight and the survival of lambs born in sheltered areas or areas without shelter. This includes both Merino and Coopworth dams and all birth types (singles, twins and triplets). In the Hamilton experiment, shelter was of greatest benefit to twins and triplets (Table 2). This is because they tend to have lower birth weights and consequently higher surface area to body mass ratios which makes them less resilient to cold exposure. Across both ewe genotypes the twin lamb survival at the average birth weight increased from 76% in the open areas to 87% in the sheltered areas. This represents a 15% increase in twin lamb survival with shelter. *It should be noted that, as the numbers of triplets born in the experiment was low, the improvement in survival due to shelter is overestimated but the effect is statistically significant. 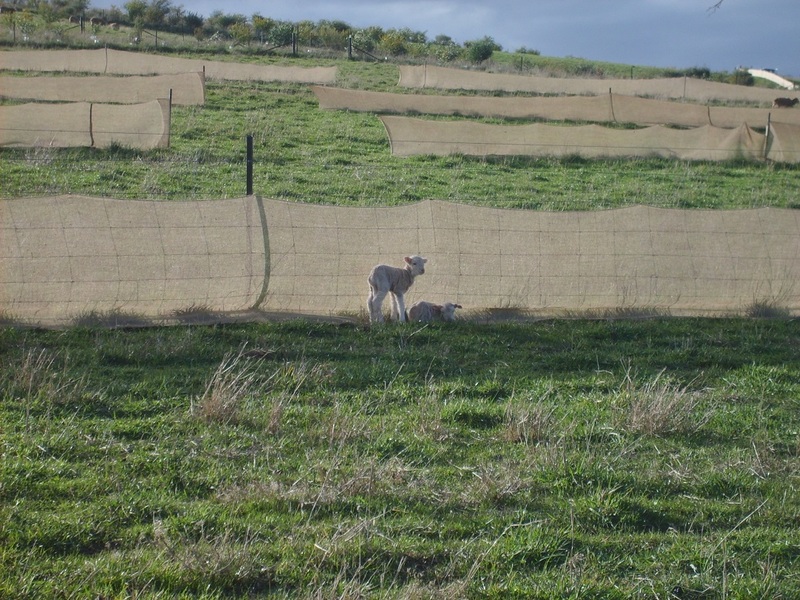 While crossbred lambs tend to be more resilient (Figure 2), this research demonstrated that, in the Hamilton environment, they can benefit significantly from shelter (Figure 7). As a result of the improved lamb survival, an extra 18 Coopworth/composite lambs and 24 extra Merino lambs were marked per 100 ewes lambing. All lambs were from terminal sires. Figure 8. 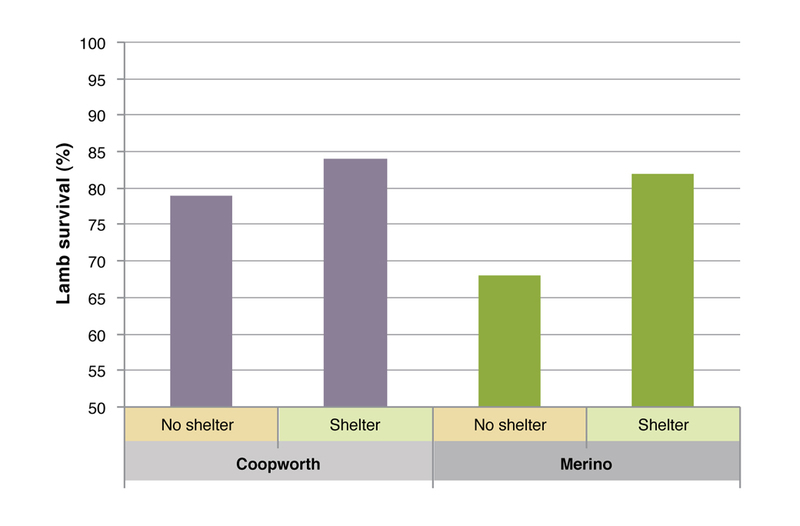 Raw average lamb survival rates for Merino and Coopworth derived lambs in shelter verses no-shelter on EverGraze Hamilton in 2009. Merino and Coopworth twin lambs derived similar proportional benefit from the shelter (i.e. 15% increase in survival). Coopworth lambs still had a higher overall survival than Merinos. This means the Merino twin lambs began with lower survival rates and still had lower survival rates even with shelter when compared to the Coopworths but proportionally they achieved the same increase. See also Industry Survival Targets – “Turning reproductive potential into reality”, Trompf, 2012. In the Wagga Wagga experiments, mild weather occurred during lambing. The chill index exceeded the critical 1000 kj/m2/hr on 22 to 37% of days during the lambing period in 2007 to 2010. Only two or three days of rainfall of 5mm or more occurred in 2007 to 2009 but seven (21% of days) occurred in 2010. Maximum daily wind speeds were above 8km/hr on 59 to 68% of days in all years except 2010, when it occurred on 40% of days. The survival of single lambs was not increased by shelter (75% compared with 80%) in 2008-09. The survival of twin lambs was 10% higher in shrubs compared with hessian shelter (77% compared with 70%) in 2008-09. 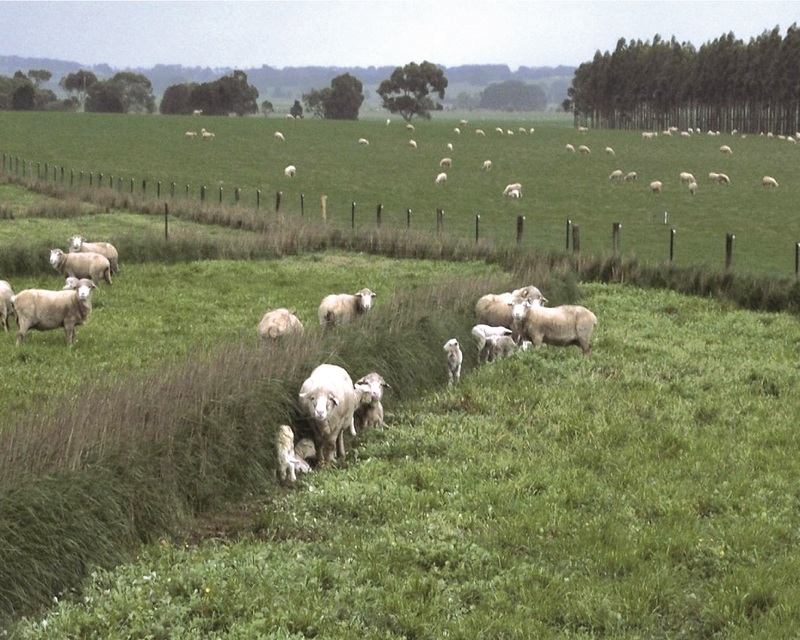 In 2010, the survival of twin lambs was not increased in shrub compared with unsheltered paddocks (72% compared with 69%). Survival of twin lambs was reduced when twin-bearing ewes were stocked at 30 compared with 16 ewes/ha (63 versus 83% survival) in hessian rows. The extent of financial returns from shelter in different regions will depend on the degree of chill risk. In the results described above, the higher number of bad chill days at Hamilton compared to Wagga Wagga, was most likely the reason for the higher impact of shelter on lamb survival at that site. In a modelling exercise, the risk of high chill index was compared for six locations (Armidale, Orange, Hamilton, Temora, Wagga Wagga and Yass) (Broster et al. 2012). Risk of a high chill index varied between locations and at different times of the year (Figure 8). The results indicated that Orange has a high risk of chill during the key lambing months, but a reduction in wind speed needs to be significant (e.g. 75-100% to have a major impact due to the cold temperatures and rain that also prevail during those months). Hamilton and Yass are two other environments considered in this modelling that would benefit significantly from effective wind speed reduction. In contrast, based on this modelling a location such as Temora would gain little from wind speed reduction and a shift of time of lambing to avoid the months of July and August would remove the majority of risk from chill in this environment. Figure 9. Likelihood of median daily chill index exceeding 1000 kJ/m2.hr for 24 weekly periods from May to October with 0, 25, 50, 75 and 100 % wind speed reduction at different locations at a) Armidale, b) Hamilton, C) Orange, d) Wagga Wagga, e) Temora and f) Yass. At the Bengworden EverGraze Supporting Site near Bairnsdale in East Gippsland, the number of wind chill days was reduced by 79% in 2010 (38 days vs 8 days) and 60% in 2011 (27 days vs 10 days) in saltbush hedgerows compared to an area with no shelter. However, the difference in marking percentage between the two areas was small, with increases of 6% in 2010 and 2% in 2011. This result is likely due to the lack of adverse weather conditions in Bairnsdale. A new calculator, EverGraze Shelter for Lambing Tool is now available to help determine the economics of establishing specialised lambing shelter areas in different regions of southern Australia. As a rule of thumb, if the average chill index during lambing is 900 kJ/m2/h or greater, then a hedgerow system or some other type of shelter is likely to be profitable. Shelter is most beneficial to Merino systems and ewes with a high proportion of multiple births. All of these options can be compared on the shelter tool. Table 4 below sets out some general recommendations on the benefits of shelter in different regions. Figure 10. 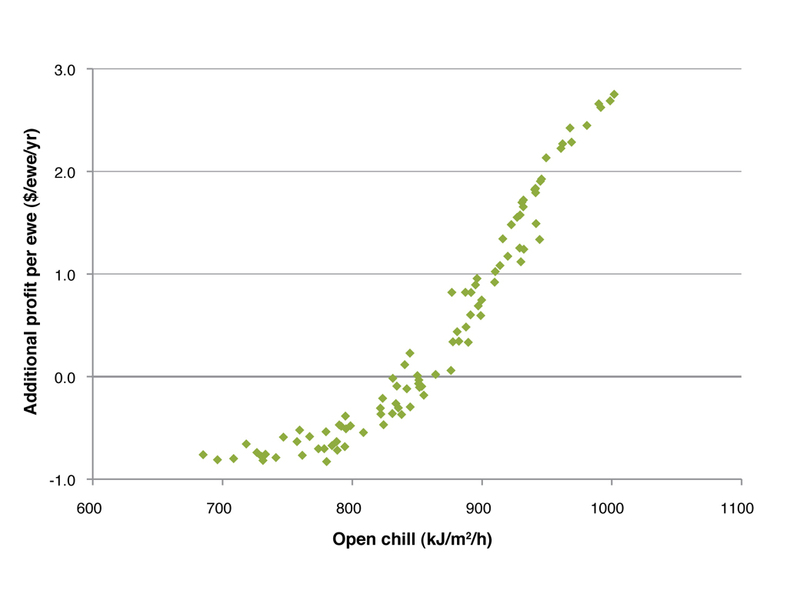 Relationship between the mean open chill in the month of lambing and the additional profit per ewe for a Merino wool enterprise where 50% of ewes are carrying twins across a number of environments and lambing months. This video produced by the MLA shows the Curries EverGraze Supporting Site in South West Victoria. The Curries have set up perennial tall wheat grass hedges and have substantially increased their lamb survival percentages. not create a physical barrier that may cause separation of ewe and lamb. Existing natural shelter (tussocks, trees, landscape, tall pasture, rocks) should also be considered as they may be as effective, but lower-cost, compared with purpose-built shelter. At EverGraze Hamilton Proof Site, the hedges were sown in strips 1-1.5m wide every 10m. Commercially these could be sown at wider spacings that allow efficient use of machinery to sow, spray or cut hay between the hedges. There is also the opportunity to utilise an existing paddock and simply spray out the rows and direct drill in spring. EverGraze case studies ‘Curries – Sheltering Their Income’ and “Saltbush hedgerows – trading low productivity for high protection”, discuss the establishment of hedges and shrubs on a commercial scale and how they have been integrated seamlessly into grazing operations. How much shelter is needed? Hedges, shrubs and tree shelter primarily operate by reducing wind speed. The amount of shelter needed will depend on the topography, weather during lambing, mob size, and the proportions of singles and multiples in flocks that need protection. Where access to shelter is limited, it is best to pregnancy scan and allocate multiple-bearing ewes to sheltered paddocks with good feed prior to lambing. Stocking rates within the shelter should consider how long the available feed between the rows will last, as well as the potential reduced survival under higher stocking rates (see above: Higher survival rates at lower stocking rates). Supplementary feeding during lambing has the potential to cause mis-mothering and so reduce lamb survival. Providing shelter is only one of several practices that need to be put in place to increase lamb survival. For further information on best management principles for increasing lamb survival, see the EverGraze Exchange – Improving survival of lambs. What are the financial benefits of shelter at my locality? The financial benefits of shelter are greatest in areas that are wet and windy at lambing time, but also depend on costs and returns from the sheep enterprise and the cost of shelter. To assist producers determine benefits for their own location, the EverGraze Shelter for Lambing Tool can be used. This tool is based on analysis of climate and farm economics to determine the locations and months where investment in shelter shows a good return. In exposed areas such as southern Victoria and the Tablelands of New South Wales, investment in shelter for July lambing has a payback period of four years or less, whereas for milder lambing months and regions there can be little or no overall financial benefit of shelter. The mortality of twin lambs and financial returns of shelter for July lambing are shown in Figure 11 and Table 4 for 100 climate stations across southern Australia. At most sites July has the most difficult weather conditions for lambing, but also the greatest returns from shelter. To calculate the lamb mortalities shown in Table 4, published equations relating mortality to weather conditions were applied to hourly weather data recorded by the Bureau of Meteorology. The financial returns shown in Table 4 are based on a Merino ewe flock mated to terminal sires, a carcass price of $3/kg, a scanning rate of 30% twins, 30 ewes per hectare of shelter at lambing, a 15 year investment period, and establishment costs for the sheltered lambing area of $250/ha. In the Shelter Investment Tool, financial details can be tailored to individual property conditions. To estimate returns from shrub maternity wards, use establishment costs from the “Cost of the Wagga Wagga Shrub maternity wards” section below. Most of the weather stations used for this analysis are situated in exposed locations such as airports, and would be representative of exposed paddocks. However a few are situated in more sheltered areas such as valleys, and would not be representative of exposed paddocks. Some local knowledge is therefore worthwhile in choosing which weather station is most representative of the lambing paddocks. Figure 11. Chill categories for July lambing in southern Australia, calculated from hourly data for wind speed, temperature and rainfall from the Bureau of Meteorology. The 2-letter station codes refer to stations in the Shelter investment tool. Click to enlarge. Table 4. 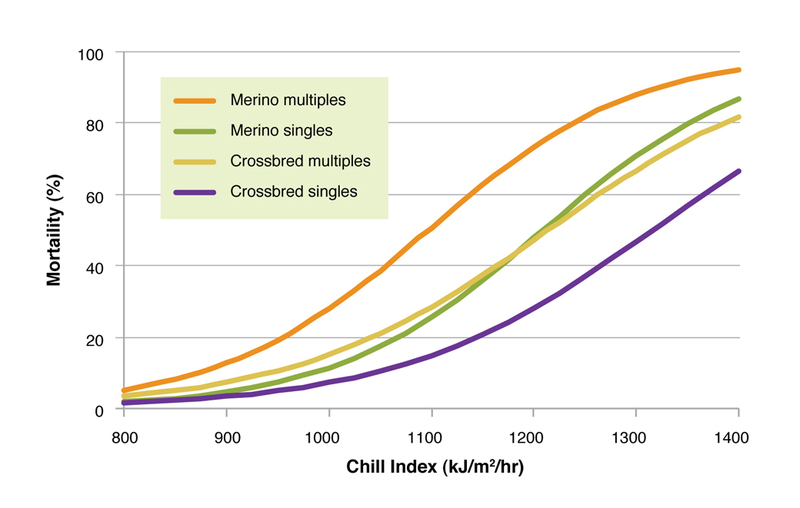 Chill categories used for the map in Figure 11, corresponding mortalities of Merino twins, and financial returns from investment in shelter for a Merino ewe flock mated to terminal sires for a July lambing, a carcass price of $3/kg, a scanning rate of 30% twins, and establishment costs for the sheltered lambing area of $250/ha. At the EverGraze Hamilton Proof Site in 2009, providing shelter to Merino-born twin lambs increased profits by approximately $5/ewe mated (not just those carrying twins). This would be sufficient to pay for the establishment of hedges (at $250/ha) in three years. the proportion of multiples in the flock. Modelling for the Hamilton environment indicated that if a 20% increase in survival can be achieved, then it is highly profitable in every scenario of price, proportion of ewes carrying twins, and survival level without shelter. However, if only a 10% increase in survival can be achieved, then under some scenarios, the money invested in establishing the hedgerows will not be recouped. It is important for individual producers to have an idea of the potential increase in survival likely on their farm. This will require benchmarking current lamb survival rates through the use of pregnancy scanning and measures of lamb marking percentage. The modelling undertaken by Young also shows that the economic returns from providing shelter were greater for the dual-purpose Merino system than the self-replacing Merino system, especially when meat prices were higher. At Wagga Wagga, the cost of establishing the shrubs was $450 for every one hectare protected. This was based on planting shrubs over 2.7ha within a total area of 13.8ha (leaving 11.1 ha of sheltered paddock for the ewes to graze in) and included cost of the shrubs, tree guards, labour, ripping and herbicide application. A further $2750/ha was spent on fencing to protect the shrubs and their understory from grazing. The annual cost will depend on shrub longevity and whether self-seeding is sufficient. Saltland Genie provides several examples of where direct seeding of salt-bush shrubs has been successful for less than $400/ha, and with no fencing required. The Bengworden case study demonstrated how a lambing paddock could be set up in this way. Is vegetative shelter for lamb survival for you? 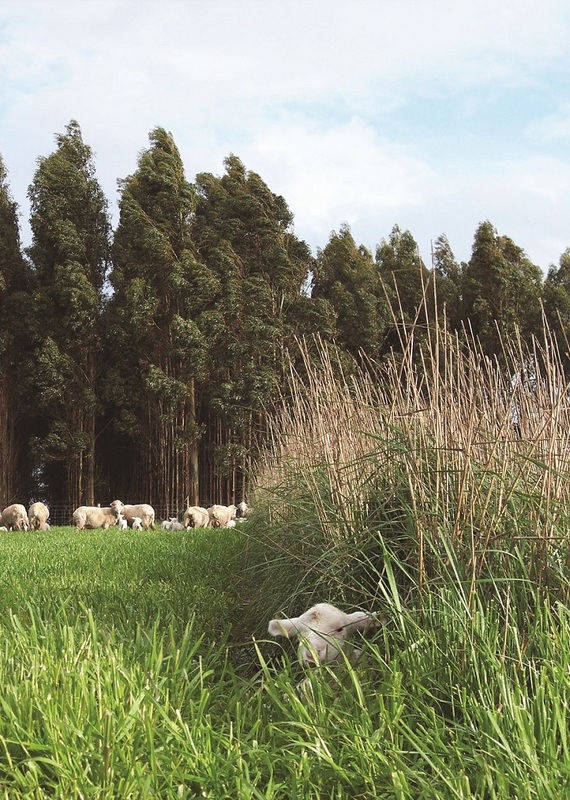 The results demonstrate that providing shelter in the form of perennial grass hedges can significantly increase lamb survival in environments that are at high risk of poor weather during lambing. To the industry, the potential benefits to welfare and earnings from investing in shelter in high risk areas are significant. Considering the six million ewes in south west Victoria alone, and assuming current survival levels of approximately 70% at average birth weight in open areas, a 50% adoption rate would result in a potential 63,000 lambs surviving that would otherwise have died from exposure. These benefits would extend to several other high risk regions. shelter belts suit your farm management. EverGraze is a Future Farm Industries CRC research and delivery partnership. The Hamilton EverGraze Proof Site team was led by Dr Ralph Behrendt and consisted of scientists and technical staff from Agriculture Victoria. The Wagga Wagga Proof Site team was led by Dr Michael Friend and consisted of other scientists and technical staff at Charles Sturt University and the Department of Primary Industries NSW. Economics modelling of the shelter work at Hamilton was done in collaboration with the Sheep CRC. At both sites, Regional Advisory Groups consisting of farmers, consultants, extension officers and CMA staff provided significant input into the direction, management practices and interpretation of outcomes from the experiments to make them relevant to farmers. EverGraze Phone Seminar – Turning reproductive performance into reality – audio. EverGraze Phone Seminar – Turning reproductive performance into reality – powerpoint presentation. Bird PR, Lynch JJ. Obst JM (1984) Effect of Shelter on Plant and Animal Production Animal Production in Australia. 15, 270-273. Broster JC, Rathbone DP, Robertson SM, King BJ, Friend MA (2012a) Ewe movement and ewe-lamb contact levels in shelter are greater at higher stocking rates. Animal Production Science 52, 502-506. 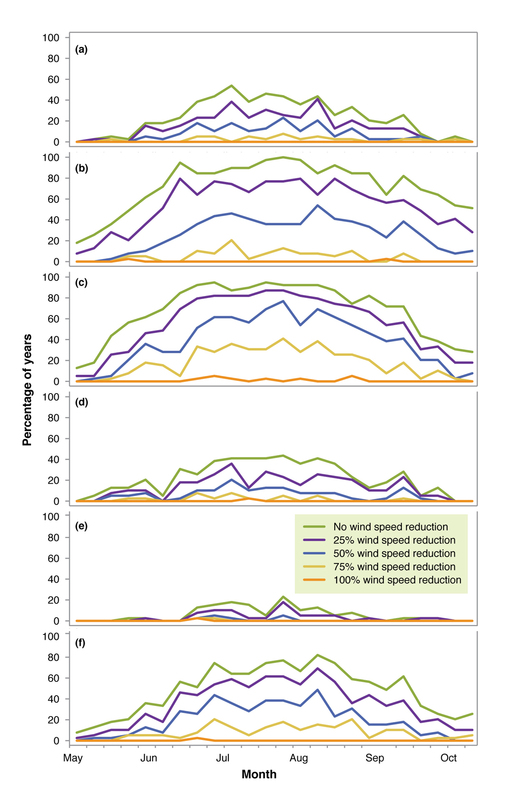 Broster JC, Robertson SM, Dehaan RL, King BJ, Friend MA (2012b) Evaluating seasonal risk and the potential for windspeed reductions to reduce chill index at six locations using GrassGro. Animal Production Science 52, 921-928. Robertson S, King BJ, Broster JC, Friend MA (2011) Survival of twin lambs is increased with shrub belts. Animal Production Science 51, 925-938. Robertson SM, King BJ, Broster JC, Friend MA (2012) The survival of lambs in shelter declines at high stocking intensities. Animal Production Science 52, 497-501.